Roasted pumpkin or squash seeds are a great snack to carry in your day pack. They are packed full of fat, fiber and protein to keep you going during the day. Preparing them is quick and easy. They can be roasted and placed on crackers (like shown below), but on top of a salad, or eaten alone! Turn the gas burner on low and roast the seeds in the frying pan. Roast the seeds (without oil) until the inner moisture is removed. Its important to get the seeds dry before adding the oil, otherwise the seeds will not dry oil properly. Roasting take around 10 minutes. 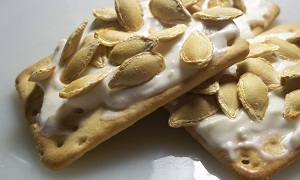 Spread cream cheese on the crackers and sprinkle roasted seeds on top! Let us know about your experience! Leave a comment below.